Knowing what she meant by “Peter?” what should I have done? I might have . . .
not been so darned eager to please my mother’s delectable new sidekick. I suppose I should have done all of that, but my mother’s hope was infectious, and Patti and I had caught it from her. It was so pleasant an illness that the three of us just sat there for a while, grinning. Then we pulled ourselves together and went out to buy a boat. Asking yourself, "What, oh what, can I do to support this work?" 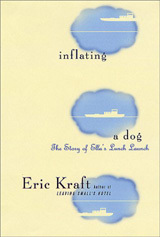 Buy a copy of one of Kraft's books for yourself. Collect 'em all! Trade 'em with your friends! Where Do You Stop? Where Do You Stop?